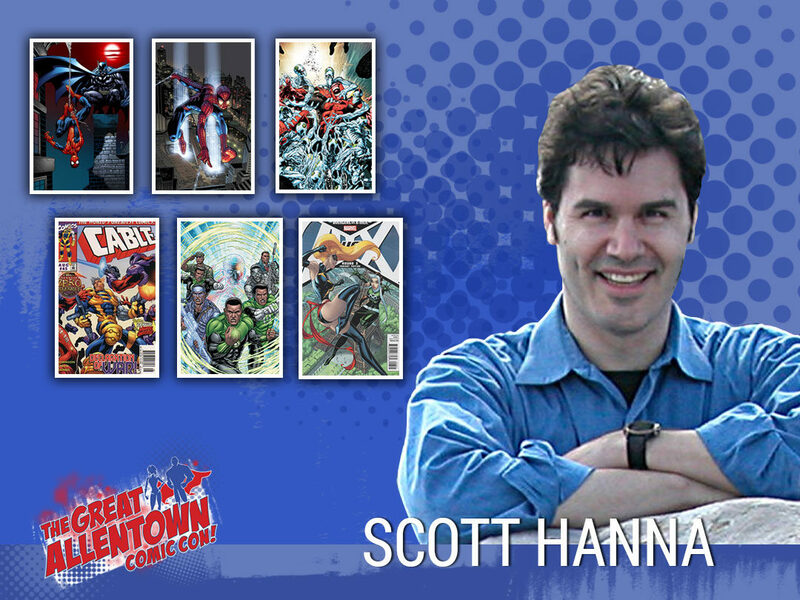 A top inker in the graphic novel industry, Scott Hanna has been drawing and inking comic books for over 25 years. His work has been published in well over 100 graphic novels, and he’s inked over 15,000 pages of finished black and white art. At Marvel Comics, Scott has worked on all the top characters, including the Avengers, Spider-Man, IronMan, the X-Men and the Hulk including a fifteen year run on Spider-man. At DC Comics, he worked on many major titles including Superman, Justice League, Green Lantern and most notably a five year run on Detective Comics starring Batman. His recent work includes IronMan, Wolverine and Captain America for Marvel, and Superman and Green Lantern Corps for DC Comics. Scott is currently working on 2 creator-owned projects. Scott received two 2012 Inkwell awards – “Most Adaptable Inker” and “The Props Award”, two 2011 Inkwell Awards for “Favorite Inker” and “Most Adaptable Inker”, the 2010 Inkwell Award for “Most Adaptable Inker”, the 2005 Wizard Fan Award for “Best Inker” and the 2002 Eisner award for “Best Serialized Story” – Amazing Spider-Man #30-35: “Coming Home”. His work appeared in the Smithsonian’s 9/11 anniversary exhibit with artwork from the book HEROES. He had a one man show at the Storefront Artist Project in Pittsfield, MA “the Art of Scott Hanna”, and his art was featured in a 2010 exhibit at the Museum of Comic and Cartoon Art in NYC. With guest appearances on national and local television, radio, museums, historical societies, libraries, the internet and national comic book conventions, Scott has made a name as an accomplished lecturer and instructor. He authored an article on the “inking process’ for Wizard magazine. Scott Hanna is a third generation artist. His grandfather did manuscript and book illumination and his mother, Annette Hanna, is an award winning portrait and landscape artist who also teaches Portraiture and Plein Air Painting at the Arts and Fashion Institute™. Scott majored in illustration at Pratt Institute in NYC. He lives in Bucks County, PA with his wife, “Project Runway” designer Pamela Ptak.